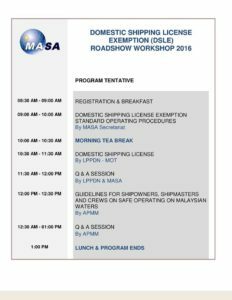 We are pleased to inform that MASA and Ministry of Transport Malaysia supported by Marine Department Malaysia will be organizing the Domestic Shipping License Exemption Roadshow Workshop – Updated on DSLE Standard Operating Procedure (SOP) Amendments. 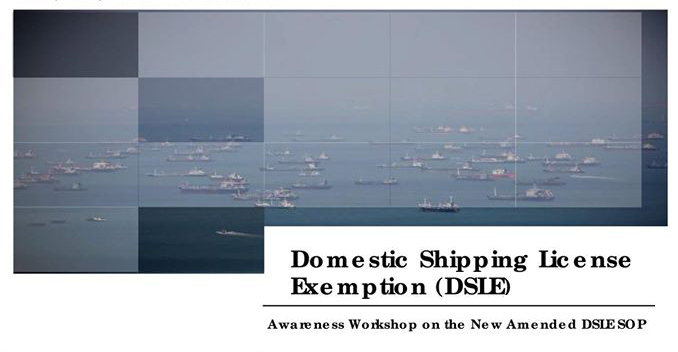 Our workshop is designed to give participants the actionable knowledge on the latest update of the DSLE SOP Amendments. 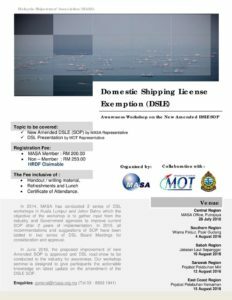 The roadshow will be held at several locations around the region – MASA Office Putrajaya, Wisma Pelaut Pasir Gudang, Jabatan Laut Sepanggar, Pejabat Pelabuhan Miri and Pejabat Pelabuhan Kemaman. For registration please feel free to call MASA Secretariat at (603) 8893 1941 /1942.